Hugo Chávez died on March 5 2013. He was President of Venezuela between February 1999 and March 2013. His long hold on power was a result of the 4 elections in which he won by clear majorities. There is little disputing the fact that his main base of support came from the poorest layers of Venezuelan society and there is a good case to be made that his period in power saw some improvement in their condition (according to the World Bank the desperately poor in Venezuela has declined from 23% to 9% of the population). Chávez's connection to “Marxism” was a complex one. In May 1996, he gave an interview with Agustín Blanco Muñoz in which he remarked that "I am not a Marxist, but I am not anti-Marxist. I am not communist, but I am not anti-communist." He was, however, well versed in many Marxist texts, having read the works of many Marxist theoreticians, and often publicly quoted them. Various international Marxists supported his government, believing it to be a sign of proletariat revolution as predicted in “Marxist theory”. In 2010, Hugo Chávez proclaimed support for the “ideas” of Marxist “Leon Trotsky”, saying "When I called him (former Minister of Labour, José Ramón Rivero)" Chávez explained, "he said to me: 'president I want to tell you something before someone else tells you ... I am a Trotskyist', and I said, 'well, what is the problem? I am also a Trotskyist! I follow Trotsky's line, that of permanent revolution," and then cited Marx and Lenin. From 1997 to 2011, he reduced the percentage of people living in moderate poverty from 54% to 31%, and those living in extreme poverty from 23% to 9%, according to the World Bank. He dramatically reduced illiteracy, set up medical clinics in slums and working-class barrios, and established discount grocery stores. These facts, however, neither match the hyperbole of the Chávez rhetoric much less the judgement that he represented any sort of socialism. Still less was he “anti-imperialist”. It is precisely this muddying of the waters, this equating of socialism with capitalism plus some level of welfare /state interference/nationalisation which keeps the world proletariat in a state of prostration before the capitalist ruling class everywhere. State capitalism is not a step towards socialism as many so-called Marxists still believe. It is a bulwark against the rise of a more class conscious workers’ movement and undermines the possibility of any political entity emerging which is genuinely internationalist (and that cannot be squared with populist ‘Bolivarism’) and with a clear programme to abolish capitalism in the only way possible: the overthrow of the existing state in favour of direct control of the economy by workers themselves through their own forms of direct democracy. This is the political direction the working class absolutely has to take if it is not to suffer ever greater levels of misery at the hands of a voracious crisis–stricken capitalism. Critics will argue that in Venezuela there have been advances in social assistance programmes for the poor, improved literacy, health care, housing and income levels for the impoverished majority. Yet the fundamentals of Venezuelan capitalism, 90% dependent on oil revenue, most of which are derived from exports to the USA, not only remain intact but more solid than when Chávez took power. Despite improvements under Chávez, the Venezuelan poverty rate remains above the Latin American average. According to Ian James, citing estimates from the Venezuelan Central Bank, the Venezuelan government "controlled" the same percentage of the economy as when Chávez was elected in 1998, with "the private sector still control[ling] two-thirds of Venezuela's economy”. Behind the showman and the apparent radical presentation, the calling of G. W. Bush a donkey and a devil, the experiments in participatory democracy which allowed the masses to think they have some degree in decision making, Chávez and his Bolivarian revolution have delivered the result that the ruling elites and their political sideshows everywhere desire: capitalist preservation. With the aid of huge oil reserves and favourable market prices for that product, Venezuela was able to buy the degree of political stability which capitalism requires and, like the multi-faceted variations of welfare and state involvement in the economy which is a feature of capitalism everywhere, the threat of the Venezuelan working class has so far been stifled under the weight of the pseudo-revolutionary ideological mush of nationalism, populism, corruption and a rate of economic expansion which allowed for some improvement of the conditions faced by the masses. However, the new reality of intense economic crisis on a world scale, has not left Venezuela unscathed. Today, Venezuelan inflation is at 25%, unemployment 8%, debt over ten times greater than when Chávez came to power. There are major shortages of basic foodstuffs and Caracas is the murder capital of the world. Rather than having set in motion a lasting solution to the economic disaster which is capitalism, Chávez and his faction of the Venezuelan ruling class were fortunate enough to take advantage of ephemeral favourable conditions which allowed them to pacify a working class which had begun to show its own power. A very real display of the ability of the working class to take on the exploiters came in a direct precursor to the Chávez era. The Caracazo was a wake-up call for that section of the ruling élite which thought repression was enough to maintain the status quo indefinitely. The Caracazo is the name given to the wave of protests, riots, looting and ensuing massacre that occurred on 27 February 1989 in the Venezuelan capital Caracas and surrounding towns. The clashes resulted in a death toll of hundreds of people with some reports of 3,000 dead, mostly at the hands of security forces. The Caracazo ushered in a period of political and social instability; the following February, the army was called to contain similar riots in Puerto La Cruz and Barcelona, and again in June, when increased transport costs ended in riots in Maracaibo and other cities. This was the context of the Chávez rise to power. He was the leader of a failed coup attempt in February 1992 which had been prepared for years and did have substantial support. It allowed him to present himself to the desperate as an enemy of the kleptocracy and would eventually lead to his assumption of power through the ballot box. However, let us keep in mind that the Caracazo was founded on the rudimentary class refusal to go along with the old order that had kept them in degradation under the harshest repression for decades. If the ruling class could not directly quell the awakening giant whose collective power will always remain their constant threat and potential gravedigger of the system they need another strategy. Chávez, and his ideological bag of tricks, was the vehicle for derailing an increasingly vocal social movement onto a safe terrain. We thus have nothing but condemnation for the ideological Frankenstein monster Chávez attempted to palm off as “revolutionary socialism”. It has nothing to do with the establishment of a genuinely socialist society as envisaged by Marx. This is a society which cannot be imposed from the top down but has to be built by the self-activity of millions of workers around the world. An exceptionally abused proletariat which had begun to act, even though in a rudimentary way, in its own defence in Venezuela was more likely to achieve this than all the “comisiones”, democratic co-ordinations and other bodies created by the Bolivarian revolution to draw the masses into support of the state. The use of referenda to vote on questions decided by the ruling group has been the stock-in-trade of all kinds of populist regimes from Louis Napoleon onwards. This has nothing whatever to do with direct workers power. Under the rule of the working class you get to ask the questions, not just answer “yes” or “no” to a question put by the ruling élite. Whatever Chávez did for the lower classes this was only a necessary overhead for continued capitalist operations in oil-rich Venezuela. He created a massive obstacle against the authentic self-organised working class, one that proved vitally useful for the national, regional and global bourgeoisie, including that of the USA. Despite all the insults and theatrical condemnation from Chávez, who denied the US moon landing, who accused the US of causing the devastating earthquake which so damaged Haiti, who over and over warned of a US invasion of Venezuela, the USA remains the number one customer for Venezuelan oil. Which brings us to the one feature of Chávez’ rhetoric that has endeared him more than anything else to the likes of George Galloway, Ken Livingstone and left supporters of capitalism in general – his much-proclaimed “anti-imperialism”. This is yet another fraud. Chávez was not anti-imperialist but only anti-Yanqui. In this respect he was in a long line of Latin American populist nationalists. This even includes Castro who began his career as a member of the bourgeois nationalist, anti-communist, Eduardo Chibas’ Ortodoxo Party in Cuba and who, on seizing power in January 1959, thought that he could negotiate a new relationship with the US. Only when the US government made it clear that they would impose sanctions on his government did Castro the nationalist suddenly discover “Marxism-Leninism” in 1961. By then the US had supported an attempted invasion of Cuba (The Bay of Pigs) but Castro’s conversion to “Marxism-Leninism” was the signal for the USSR to take over as imperialist godfather of Cuba. Castro had come to power swearing to end Cuba’s dependency on the sugar growing monoculture but now this was increased as he sold the entire zafra (harvest) to the USSR (who then sold it on at higher prices to its Eastern European satellites). Cuba was thus not “anti-imperialist” – it merely swapped one imperialist bloc for another (and for the next quarter of a century hundreds of young Cubans died in the USSR’s proxy wars in Angola and elsewhere). With the collapse of the USSR came the near collapse of Cuba which held on only by opening up to tourism (and the return of many socially undesirable features of the period before the revolution). The arrival of Chávez in power in 1998 and the influx of cheap oil in return for the sending of Cuban doctors to Venezuela saved the Castro regime. Today 40,000 Cubans officially work in Venezuela and not just in medicine. Maduro, Chávez’ chosen and Cuban-approved successor has the G2, or Cuban secret services, operating on his behalf in the country. Chávez used to call the relationship “Venecuba” as the two states have used their common agenda to forge a new imperialist interest in the area. Even this is, to a certain extent, bankrolled by China. A third of Venezuela’s oil exports to China go to pay the $42.5 billion debt accrued in the last five years. Oil wealth has also enabled him to undermine US hegemony in Latin America through his support for the election of fellow nationalists who also claim the mantle of socialism, such as Morales in Bolivia and Correa in Ecuador. 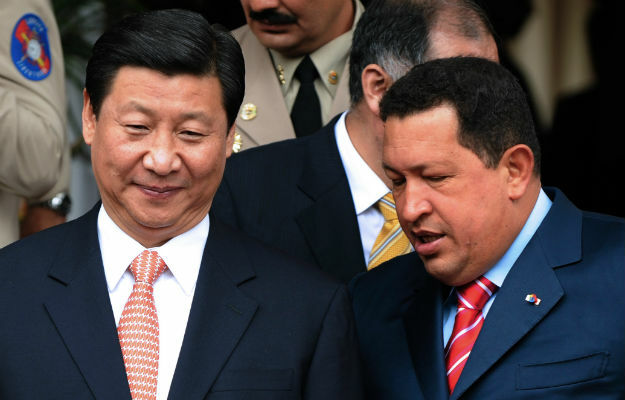 In addition cheap oil has allowed Chávez to posture on the world stage. He proffered support to a whole range of US enemies from Saddam Hussein, Assad and Iran as well as establishing closer trade links with China. These states too have, or had, their own imperialist agendas. All are opposed to the world order dominated by the US and thus Chávez has supported them. This is not anti-imperialism but just the expression of a different imperialist interest. The working class, as the “negation of nationality”, has no interest in supporting any imperialist power. Chávez’ “Socialism of the 21st Century” is neither about socialism nor is it new. It is a state capitalist project cobbled together from the hacked off limbs of the dying monstrosities of the Stalinist and Social Democratic perversions of Marxism in the last century. In the face of a decadent capitalist horror story progressively unfolding all around the world in the shape of increased poverty, unemployment, war, oppression, and global environmental disaster, Chávez’ hotchpotch of myth and real support for the forces of fake socialism provides a hypocritical veil for continued capitalist exploitation. Nothing could be more harmful to the interests of the working class and humanity in general than the falsification of its only means of defence: the socialist revolution. The prospect of a civilised human community increasingly depends on the international working class seeing the real prospect of world revolution. ’Chavismo’ is one of many schools of falsification upon which the ever-extreme polarisation between ruling class wealth and working class deprivation depend. There are no middle ways. The abolition of capitalism, the end of the class system can only be posed by resolving the question of power. This means breaking with the established order: parliaments, courts and legal systems, the constitutions which frame them, the parties and trade unions who seek a better deal for the working class when no such deal is possible with this system. Instead of going along with the empty charade of electing a representative over whom it has no control every four or five years or longer, a mark of a truly socialist movement will be when workers form their own organs of struggle based on direct democracy. These kind of bodies potentially exist whenever workers take up the struggle on their own account. When revolutionaries advocate that power be exclusively exercised by the working class in the form of recallable delegates to workers’ councils it is not the product of a utopian dream. This is the outstanding lesson of a working class revolutionary past which capital does its best to bury and distort. Even out of the defeats of the Paris Commune or the Russian October Revolution, history tells us that the working class is capable of creating its own form of democratic self-rule which can only survive when the existing state is destroyed. This is absolutely the opposite of pretending that various forms of ‘workers control’ can be pegged on to the bureaucratic state machine in the service of the capitalist class. Unlike the moonshine about Venezuelan participatory democracy, they are the sole, unlimited power. On a world scale this is what the [Internationalist Communist Tendency] is working towards. This is not a re-run of the mistakes of the past. The future World Party of the Proletariat will not be a Stalinist party. It is not an instrument to run a territorial power. It is an international instrument of revolution which cannot identify with any territory in which the working class may come to power. That is the task of the class wide bodies established in that area and as we have said no one not even the class party of the most far-sighted communists can carry out that task for the workers. They have to do it themselves for themselves. This was one of the great lessons of the Russian Revolution. At the same time the Party is an essential element in putting together all the experiences of workers in the past. Revolution cannot be made starting from scratch every time and the role of the Party is ensure that this does not happen. It will be the first to see the obstacles in the way of liberation some of which, like trades unionism, nationalism, and state capitalism posing as socialism, we have touched on in this brief article. Good article unmasking the ideological agenda behind the reformist left attempt to portray Chavez as some sort of Marxist revolutionary. Seems to me that to paraphrase I think Lenin who mentioned that the Bourgeoise always removes the revolutionary kernel from historical thinkers such as Marx/Engels today the left such as the British Socialist Appeal/IMT places a revolutionary kernel within a reformist leader/movement where one did not exist. While Chavez through the high price of oil managed to for a short period of time provide some rudimentary forms of social provision there is every sign that this was coming to a halt as the price of oil falls. There is also the uncomfortable fact for the reformists that Chavez was quite happy to use his Chavismo's to break strikes as he did on more than one occasion. One point that I think Ant could have mentioned was the reason that the USA did not intervene as aggresively in Venezuela as they did in Chile in the early 70's reflects that while USA Imperialism is still the world leader it is in a weaker position vis a vis it's competing powers such as China.